When soccer fans hear the name "Lionel Messi", it's hard for many to deny that he is one of the best soccer players in the world. Messi was born and raised in Rosario, Argentina. He was so small that doctors had to inject human growth hormone into his legs. Despite his shortcomings, Messi loved soccer and was determined to play this great sport. Eventually his talents and abilities shone. In 1999, at the age of 12, an agent heard of him through a contact in Buenos Aires and also saw Messi play in videos. In 2000, Messi got a tryout for Barcelona. It was rare and unusual that the club, which is called La Masia, would have a player as young as Messi. He was only 13-years-old when he agreed to join the club and move to Barcelona. After Messi joined the club, he and his family had a difficult time adjusting to the new continent and lifestyle. Eventually, his mom, brothers, and sisters moved back to Argentina. 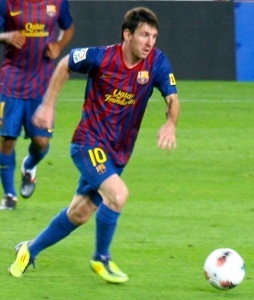 Though Messi seemed to have it all and enjoyed his role as the team's youngest player, he suffered several injuries. He really struggled during his first year in Barcelona. Nonetheless, he stuck it out, in the hopes of achieving his dream of reaching success as a professional soccer player. Since this rough start, Messi has reached his goals and achieved international fame. For example, he won the 2005 under-20 World Cup and the '08 Olympic Gold medal with Argentina. Messi hopes to keep improving. His journey is truly an inspiration.